Our path to becoming a Rights Respecting School began in September 2015. On Friday 11th September 2015 we held the first House Assemblies of the new session for P2-P7 and welcomed P2 pupils to their first House Assembly. On September 25th 2015, 193 world leaders committed to the Global Goals for Sustainable Development. Much was achieved in the previous fifteen years, and 2015 saw the halfway point towards achieving the Goals by 2030. Our House Assemblies introduced these projects to our pupils. 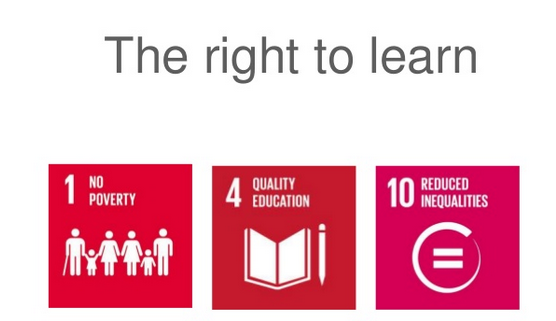 Throughout the year, we will help our pupils understand and support the Global Goals and the Articles of the United Nations’ Convention for the Rights of the Child (UNCRC) by linking them to our curriculum. At special Assemblies with Mercy Corps on Thursday 1st October 2015, P3 pupils told the school about their Harvest project to help Syrian refugees. Sciennes Primary School is proud to be one of six schools in Edinburgh committed to raising awareness of children in poverty and exploring ways in which we might reduce the ‘Cost of the School Day’. We are offering parents the chance to hear from Pattie Santelices, a member of the Health and Well Being team at City of Edinburgh Council, talk about the implication of children living in poverty in Edinburgh. * To highlight the scale and impact of child poverty. * To explore cultural and structural explanations of child poverty. * To introduce the wider ‘1 in 5’ Project. There are many costs associated with school and education (e.g. uniforms, materials, trips, meals etc…) and together we would like to explore ways to reduce these costs where possible in order to make education fairer for all. Complementary sessions are taking place with staff and pupils in school. Feedback from everyone will contribute to new Council recommendations and guidance for schools. We will officially launch Sciennes’ Playground on Saturday 31st October at 11.30am. Sciennes continued our journey to becoming a Rights Respecting School at P4-7 Assembly on Friday 30th October. Mr Howie explained that many of the UNESCO landmark sites around the world, including Edinburgh Castle, were lit up by blue lights last weekend to mark the 70th anniversary of the United Nations. (Secretary General Ban Ki-moon is also 70 this year.) Mr Howie explained the background to the United Nations and Unicef and why they were set up. 193 countries have signed the United Convention on the Rights of the Child (UNCRC) but Mr Howie asked our pupils if they believed that all children actually have these rights around the world. He then asked our pupils how they felt about not all children having their rights and to think about what they could do. The Sciennes community has already taken action to support some Syrian refugee children to have their right to play by fundraising for the P3 Harvest Appeal. £2100 has been raised to fund seven playgrounds in refugee camps and Mr Howie asked everyone to think about what else we could do to help children have their rights locally and globally. Our House Assemblies on 20th November will mark Universal Children’s Day, on the anniversary of the UNCRC, and Sciennes is taking part in the annual Unicef OutRight campaign. OutRight empowers children and young people to play a role in the realisation of their rights and to speak out in support of all children’s rights. This year OutRight will focus on children’s rights in humanitarian emergencies – empowering children to speak out and share their views on protecting children affected by these crises. Our P7 Sports Captains did a wonderful job of celebrating this week’s achievements. Our first week of using the new wildlife/nature playground area has been a great success and pupils were asked to pass on their suggestions for a name for the area to their Pupil Council rep. We look forward to the offical opening ceremony of our new playground on Saturday 31st October 11.00am-12.30pm. This session, we have begun a whole school initiative to become a ‘Rights Respecting School.’ You may already be aware that Curriculum for Excellence, Getting it Right for Every Child (GIRFEC) and How Good Is Our School (HGIOS) are constructed in line with the United Nations Convention on the Rights of the Child (UNCRC). We are aiming to achieve Level One accreditation in Unicef’s ‘Rights Respecting Schools Award’ (RRSA) by January 2017 and part of this process involves raising awareness of the UNCRC and the RRSA throughout our whole school community. Please feel welcome to contact us if you have any comments or questions. In the week that the Scottish Government joins UNICEF in launching the World’s Largest Lesson, more schools have been sharing their learning around the Global Goals. One such school is Sciennes Primary School in Edinburgh, who have been blogging about their journey to become a ‘Rights Respecting School’. Click here to find out how learners have been raising the profile of Goal 1 – No Poverty and Goal 10 – Reduced Inequalities. Keep up the good work Sciennes learners and bloggers! OutRight celebrates the UN Convention on the Rights of the Child. It takes place on the anniversary of the Convention on 20th November. In 2015, the focus is on promoting and protecting children’s rights in humanitarian emergencies around the world. Pupils at Unicef UK’s Rights Respecting Schools are encouraged to advocate for the rights of children and young people affected by humanitarian crises, build their knowledge and understanding of children’s rights, and raise their voice and views on rights with their school community and key decision-makers. Our involvement will also help our school towards meeting RRSA’s Standard D, empowering children to become active citizens and learners. Some members of our community might be interested in supporting the upcoming Friends of the Earth Scotland Climate Change march at the Meadows November 28th 2015 12pm. On Friday 13th November 2015, Mr Forrest Howie led a powerful and thought provoking P4-7 Assembly to help the children think about how they could take simple acts to bring about change. He explored inspirational examples, telling stories about Malala Yousafzai and Samantha Smith as well as George Clooney’s recent visit to Rose Street’s Social Bite Social Enterprise cafe. He also gave us historical examples of Martin Luther King’s campaign for civil rights and Emmeline Pankhurst’s campaign for Votes for Women and made us think how we can encourage and support change makers, as well as be change makers ourselves by taking simple acts, such as writing letters, like Samantha Smith did in the 1980s. We are delighted to announce that we have been awarded a ‘Recognition of Commitment‘ (ROC) certificate from Unicef; the initial staging post in our journey to becoming a Rights Respecting School. We are one of the first schools in Scotland to begin using Unicef’s brand new RRS logo. Thank you to Gerry McMurtie (Senior Professional Advisor Scotland), and Jen Drummond (Strategic Lead for RRSA in City of Edinburgh and Development Officer for Mental Health and Wellbeing) for their assistance in enabling us to announce at our first staff CPD session that we had met the standard for the ROC. In August 2011 UNICEF UK released new guidance for class and school charters. “Why have we recommended this change? We want to ensure that the RRSA community is faithful to the general principles of the Convention on the Rights of the Child (CRC). The CRC applies to all children and they are the designated rights-holders. Adults such as parents, teachers, local and central government are duty-bearers. Rights are unconditional; they are therefore not dependent upon a responsibility and cannot be taken away, earned or used as a reward. Because they are universal, however, children and adults should be encouraged to show rights-respecting behaviours. In this way individual children can both enjoy their own rights and respect the rights of others. We want all the adults, children and young people in rights respecting schools to understand the nature of rights as inalienable, universal, unconditional, inherent and indivisible. Rights do not come with responsibilities attached. It may be possible to refer to responsibilities if you can ensure that everybody understands that children are not the duty-bearers and that the rights are not a reward for the fulfilment of a responsibility. Our custom and practice was to recommend that schools established a negotiated agreement which focused on children’s rights and their responsibility to behave and speak in a way which respected that right. Over time we have come to see this as a risk. By linking rights and responsibilities so closely it may lead to a fundamental misunderstanding. The new guidance has been developed to strengthen the school ethos by incorporating the role of the duty-bearers. Our new charters are negotiated agreements which identify the rights-respecting attitudes and actions of children and adults and the language has shifted from responsibility to respect. Sciennes’ Pupil Council is leading a ‘Hungry for Books’ campaign, launched at House Assemblies on Universal Children’s Day 20th November and taking place ONLY throughout Book Week Scotland from Monday 23rd November to Friday 27th November 2015. We have been asking our pupils how they can make simple acts to bring about change and highlighting the Global Goals at our Assemblies. Sciennes Primary School is proud to be one of six schools in Edinburgh working with Pattie Santelices (City of Edinburgh Principal Officer Mental Health and Well Being) and committed to raising awareness of children in poverty. * To highlight the scale and impact of 1:5 child poverty. Last year, P3 pupils successfully organised a whole school Harvest appeal leading our school community to donate food items generously to Foodbank. This year, we are asking everyone to feed minds by donating at least one ‘preloved’, much loved, quality children’s book which will then be redistributed by Foodbank and other organisations. Sciennes is one of six school hubs for the city – Central Hub – and our Pupil Council members will work with volunteer Librarians to help collect and deliver donated books. Did you know that 1:5 children live in poverty or have at some time in their lives? This is shocking to us in Sciennes’ Pupil Council. And we want to help. So we have decided to do a book collection. Please give a child in poverty a book to pass the time and make them feel like an ordinary child. And try to think how many hours are really in a day when you don’t have the money to buy expensive video games and other things. So please bring a book for the book bank. 1:5 children living in poverty leave school unable to read well. These children are also less likely to have books in the home and read for pleasure. During Book Week we are seeking donations of high quality children’s books which our Pupil Council will then redistribute to children in need through Foodbank. I would also like families in school, who would welcome an opportunity to select some books, to please contact me directly. I can assure you of my utmost discretion and confidentiality. On Friday 20th November 2015, Universal Children’s Day, on the anniversary of the UN Convention of the Rights of the Child, our P2-P7 pupils thoroughly enjoyed listening to Kid President’s ‘Pep Talk to the World’ on the Global Goals. Last week at the P4-7 Assembly, Mr Howie shared the story of Samantha Smith, the Little Ambassador, as an example of how we can make simple acts to bring about change. Kid President (Robby Novak) began making films with his family (writer and director Brad Montague) and publishing them online, based on the belief that children have ideas worth listening to. The charming and amusing musings quickly set the Internet alight and led Robby to meet the real President, Barack Obama. The insirational pep talk to the world below – urging people to think of the world as ‘one big cool table’ where everyone is invited and everyone has enough – truly captured our pupils’ imaginations. If the Global Goals are going to work – they need everyone to know about them. You can’t fight for your rights if you don’t know what they are. You can’t convince world leaders to do what needs to be done if you don’t know what you are convincing them to do. If they are famous they won’t be forgotten. Tell everyone. Sciennes’ Pupil Council thanked everyone for supporting City of Edinburgh’s 1:5 Child Poverty Awareness project throughout Scottish Book Week by donating preloved, much loved and gift condition books to a child via Foodbank and other organisations. Please note that the project has been extended at Sciennes and we will still be collecting donated books until Wednesday 2nd December. We hope to see you at the Winter Fair on Saturday 28th November 12pm-3pm. Coming along? Could your child select a favourite, high quality book to bring to gift to a child in need? Throughout December, our Pupil Council worked with our Librarian, Mrs Katherine Peace, to sort and categorise over 1000 quality, pre-loved books which were donated before Christmas to Foodbank and other local charities. Grateful thanks to everyone who supported our Hungry for Books appeal with City of Edinburgh Council. On Friday 22nd January 2016 we welcomed former pupils Jessica, Katie and Anna to speak to our pupils at Assembly. The girls are now in their Sixth Year at James Gillespie’s High School and are about to embark on a visit to Zwelibanzi High School in KwaZulu-Natal, South Africa, as part of a longstanding twinning between the cluster schools. Pupils and families have been asked to support JGHS’s annual ‘Donate a Pencil Case’ appeal. Donations will be gratefully received and can be handed to the School Office until 9th February. Jessica, Katie and Anna will collect them before they fly off on 11th February. Classes focus on other articles when these are relevant to their learning. All 42 Articles are contained in this slideshow, with simplified language. Our three Primary Seven classes are attending a special showcase of ‘Inside Hana’s Suitcase’ at the Filmhouse Cinema on Wednesday 27th January 2016, to commemorate Holocaust Memorial Day. Our Class Teachers are experienced in handling this topic sensitively each year to help us learn lessons in how we treat one another. Mr Howie, who is a trained Holocaust Educator, has also been working with our P7 pupils. Article 29 You have the right to education which develops your personality, respect for other’s rights and the environment. What would you do with £250 to help Make a Difference? Sciennes’ Pupil Council met on Friday 29th January to plan a school wide launch of City of Edinburgh’s ‘Make a Difference Award‘. Pupils will take the lead in encouraging fellow pupils, classes, staff and parents to submit ideas of how they would use the award money to help make a difference to children and families living on or below the poverty line in our school community. Raising awareness of the realities of living in poverty in the UK. Contribute towards reducing school costs e.g. uniform, trips, books and resources for those most in need. Support income/benefits advice and management for families. Any other ideas you might have to Make a Difference? Schools will submit their top three ideas for judging by an independent panel. the winners from each school will then be invited to present their idea at the 1 in 5 Launch and Roll Out event on the 22nd March before receiving the £250 award money to take forward their idea in their school. Individual or groups of staff, parent councils, individual pupils or classes/tutor groups. How do I/ we enter? Contact your school to receive a Make a Difference Award submission form. Pupil ideas will be collected in class. Jonathan in P7B, assisted by Sam, gave a superb presentation to the P4-7 Assembly on Friday 29th January 2016 explaining how he has made a difference by supporting the Re-Act Scotland charity for Syrian refugees. He demonstrated how he has achieved the ‘Me and My World’ section of the Junior Award Scheme Schools and provided an exemplar model for other pupils to follow. Very well done, Jonathan! We have been learning Hopscotch Theatre’s “We’ve Got the Right” song and look forward to their visit to school for two performances of their production “The Rights of the Child” in March for P1-P7 pupils. Article 42 All adults and children should know about this convention. At the P4-7 Assembly on Friday 5th February 2016 P7 House Captains helped us think about the Golden Rule and how it can help us to RESPECT each other’s RIGHTS. Sciennes’ Pupil Council have planned a school wide launch of City of Edinburgh’s ‘Make a Difference Award‘. Pupils are taking the lead in encouraging fellow pupils, classes, staff and parents to submit ideas of how they would use the award money to help make a difference to children and families living on or below the poverty line in our school community. Make, Wear, Share a green heart this Valentine’s Day to raise awareness of Climate Change and #ShowTheLove for what could be lost. 91 Primary Six pupils got together on Tuesday evening to Make and Share a collage heart of natural materials scavenged in the grounds of Benmore Outdoor Education Centre. They were keen to get involved in a Valentine’s Day campaign to raise awareness of Climate Change and #ShowTheLove for what could be lost. Thank you to P7 pupils Luke and Lena and to Ms Kennedy (Support for Learning Specialist and Reading Co-ordinator) for their presentation about the exciting launch of our new Playground Reading Shed on World Book Day, Thursday 3rd March. We hope families will consider joining this year’s Fairtrade Fortnight campaign – “You eat, they eat” by choosing some Fairtrade products, at breakfast time particularly. The Global Goals for sustainable development could get these things done. In all countries. For all people. If the Goals are going to work, everyone needs to know about them. TELL EVERYONE. To Sciennes parents and pupils, a huge thank you for all your pencil case donations. We were overwhelmed by your kindness and generosity. We have just returned from South Africa and it was fantastic to be able to give your gifts to the children fron Charles Memorial primary school where they were greatly appreciated. The children were so excited as you can see from the attached photos. On Friday 4th March 2016 at Assembly, Arleen Sinclair from ChangeWorks successfully challenged P4-7 pupils to think about how we can reduce waste by recycling and re-using and how to make sure our playground and school are Grade A Litter Free. Our ECO team will meet next week (Waste Week) to discus and decide how to take forward improvements. House Captains helped celebrate the launch of our wonderful new Playground Reading Shed on World Book Day (3rd March) and pupils’ recent achievements. Some of our Eco Team members were at the ready today with our brand new litter pickers and found… they didn’t need to use them! Great impact from Arleen’s ChangeWorks Litter Assembly on Friday with her message which challenged us all to reduce litter and waste and aim for a Grade ‘A’ playground! Let’s keep it that way! You have the right to be with friends and join or set up clubs, unless this breaks the rights of others. Sciennes Primary School is aiming to become recognised as one of Unicef’s Rights Respecting Schools. Throughout this year we have been focusing on Rights Education and embedding respect for children’s rights in our school. We are maintaining a school blog on our progress towards becoming a Rights Respecting School. https://eurochild.wufoo.eu/forms/sketch-my-rights by 15th April 2016. Please feel welcome to give a copy of your child’s drawing to Ms Anstruther, Ms Gallagher or Mrs Noble. Picture your rights and bring your voice to the Eurochild Conference 2016! Upload a drawing of a right you think matters most to you! Your drawings will feature in Eurochild’s conference materials and you could win a trip to meet European officials and other young people like you in Brussels! Read more about the Eurochild Conference 2016 here. Many thanks to Ross, Liam, Sophie and Jen from Hopscotch Theatre for a high quality production of ‘The Rights of the Child’ that made learning about children’s rights fun and engaging for our 655 P1-P7 pupils on Thursday 10th March. Excellent feedback from pupils and staff and we congratulate the team on making the show so accessible and entertaining for all age groups. Bravo! The show links to rights being being unconditional in a very clear and fun way! RRSA and Scottish Government/Education Scotland focuses on the message that children do not need to do anything to have rights, which comes across excellently in Hopscotch’s ‘Rights of the the Child’. Hopscotch’s involvement in Scottish school pupils’ lives is a creative and stimulating experience. Education performances such as ‘Rights of the Child’ continue to develop the breadth of experience that Curriculum for Excellence is designed to deliver. Schools were invited to submit ideas on what they would do with £250 to help Make a Difference. Five members of Sciennes’ Pupil Council have been invited to the Scottish Parliament to submit our best ideas to City of Edinburgh’s ‘1 in 5’ Make a Difference Award Ceremony on Wednesday 16th March. Ms Anstruther will accompany. Mr Howie led our P4-7 Assembly on Friday 11th March 2016, cleverly linking recent learning in P5 Old Edinburgh, P6 Jacobites, World Book Day and International Women’s Day with Rights Education in his tale of the mightily impressive Victorian philanthropist, Angela Burdett-Coutts. Her philanthropy and influence were even more remarkable at a time when women could not yet vote. Mr Howie encouraged everyone to keep thinking about how we can each make a difference and praised pupils Alex and Rory for their initiative in organising donations of Easter eggs for Foodbank at school. P7 Reader Leader, Toby, explained how everyone can help keep the Playground Reading Shed organised and Lena told us about the Eurochild Drawing competition. Sport Relief is on Friday 18th March and our P7 Sports Captains demonstrated Out of the Ark’s “Step It Up” Sport Relief dance. They informed pupils about signing up online to local Run, Cycle, Swim events next weekend and invited us to dress up in sports gear or P.E. kit on Friday. Sports Captains will collect any donations on the day. Pattie Santelices, City of Edinburgh Principal Officer Health and Wellbeing, joined our Assembly on Friday 18th March 2016 to share information about City of Edinburgh’s 1 in 5 Child Poverty Awareness project. Ms Anstruther accompanied five Sciennes Pupil Council members to the Scottish Parliament on Wednesday 14th March and she announced that two of our P2 pupils, Emma and Bella, have won an award for their idea to ‘Make a Difference!’ They cleverly suggested that school could keep a ‘dressing up’ box of costumes for pupils to borrow and their idea was awarded £250! Ms Anstruther invited everyone to donate any unused costumes to school to add to the collection for borrowing. We were all absolutely delighted when Pattie announced that P6B pupil Asma’s poster, highlighting 1 in 5 Child Poverty, has been selected as overall winner and will be used in campaign literature throughout Edinburgh! Pattie presented Asma with a framed copy of her artwork and a certificate. Runner up P6C pupil Samara also received a framed copy of her artwork. All the children who entered the competition received special highlighter pens for their contribution in highlighting 1 in 5 child poverty. Thank you to Art Club Teacher, Heather Lucchesi, and to Ms Anstruther for helping the pupils express their ideas so well visually. All the pupils were congratulated for helping to Make a Difference by dressing up in sports gear and P.E. kit and donating to Sport Relief. Our end of day total was £450! Congratulations to Ella, Ailsa and Sarah for showing great initiative in organising their own bake sale and raising £14. Very well done to P7A and P5C girls who raised an incredible total of more than £400 rollerskating across the Forth Road Bridge! We look forward to hearing about any other personal fundraising efforts from our pupils since many are taking part in local run, swim or cycle events this weekend. Extraordinary Sport Relief fundraising P7A and P5c girls! Ella, Ailsa and Sarah baked to raise £14 for Sport Relief. Great initiative! P7 Sports Captains congratulated pupils for their achievements this week and led everyone in singing the Sport Relief song, “Step It Up”. Special commendation to Alex, Rory and Alex for their initiative in Making a Difference by organising a school collection of Easter eggs for Foodbank. Outstanding citizens! Thank you to everyone who donated. Sciennes is one of six city schools taking part in a City of Edinburgh pilot project to raise awareness of 1 in 5 Child Poverty and explore ways to reduce the cost of the school day. Depute Head, Ms Carolyn Anstruther, accompanied five Sciennes Pupil Council members to the Scottish Parliament on Wednesday 14th March and she announced at Assemblies on Friday 18th March that two of our P2 pupils, Emma and Bella, have won an award for their idea to ‘Make a Difference!’ They realised that events like World Book Day can cause expense for families so cleverly suggested that school could keep a ‘dressing up’ box of costumes for pupils to borrow and their idea was awarded £250! Ms Anstruther invited everyone to donate any unused costumes to school to add to the collection for borrowing. On Friday, 15th April 2016, Sciennes’ four Houses – Grange, Lauder, Sienna and Tanatallon – celebrated World Art Day on the birth date of Leonardo da Vinci. House and Sports Captains shared information about their favourite artists. Sciennes’ annual Swimathon event takes place week beginning 25th April and we are supporting UNICEF’s Day for Change on Friday 13th May. A reminder that Monday 18th April is a holiday. Please collect loose change and bring to school on Friday 13th May to support Unicef’s ‘Day for Change.’ Thank you. On Friday 22nd April 2016, we celebrated Earth Day by watching the Climate Coalition’s film (scripted by Michael Morpurgo and starring Jeremy Irons) and Greenpeace’s “Give the Earth a Hand” video. Mr Howie led the P4-7 Equal Rights Assembly on Friday 29th April 2016. He explored a definition of ‘prejudice’ with the pupils and asked them to consider how they can play a part in making sure everyone is included. P7 Sports Captains announced how well each House had done in our fantastic Swimathon this week, swimming the equivalent of Sciennes to Benmore! Sports Captains also congratulated pupils on recent achievements and Yash – who won both Racquet tournaments last year – presented the EPSSA Badminton trophy to this year’s winner, Ellen. Well done to Erin who came runner up in both Badminton AND Tennis tournaments. Global Goals: end poverty, combat climate change and fight injustice and inequality. Please collect loose change and bring to school on Friday 13th May to support Unicef’s ‘Day for Change.’ Thank you. Pupils can wear blue, if you wish. On Friday 13th May Sciennes will be supporting UNICEF UK’s Day for Change and we very much hope that you will join us in supporting this event. It is a great opportunity for our pupils to learn about and raise money for children in other parts of the world. By donating loose change, we can help UNICEF protect children in danger around the world.Pupils may also wear blue, if you wish. Every year, UNICEF UK’s Day for Change focuses on a different theme. In 2016, Day for Change is all about protecting children caught in emergencies such as the Nepal earthquake and the Syria conflict. On Friday 20th May we will share information with pupils at Assembly about our International Summer Fair on Saturday 4th June. 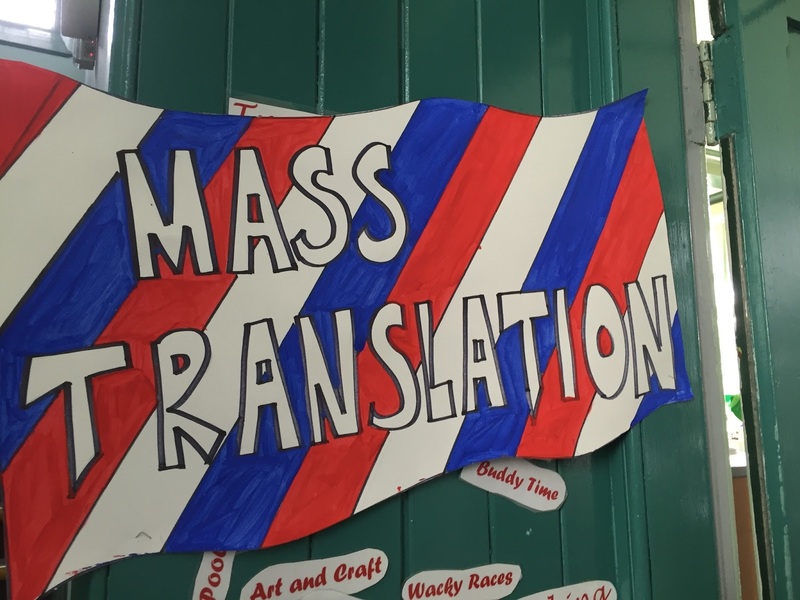 We will also celebrate the tremendous progress in City of Edinburgh’s 1+2 Languages at Sciennes this year, so ably led by our Languages Co-ordinator Bethan Owen, and thank our three Spanish support assistants – Primary Student Volunteer Language Assistant Initiative (FLO project): Manuel, Sergio and Isabel. We have also been extremely fortunate to host Erasmus Scholarship Spanish student Ana Vidal, final year Bilingual Primary Education Teacher from the Complutense University of Madrid. The ChildLine Schools Service is a programme delivered by ChildLine staff and volunteers for every child in the UK in Years 5 /6 ( in England & Wales) and Primary 6/7 (in Scotland & Northern Ireland). ChildLine have been providing presentations and workshops for our P6 and P7 classes every two years since 2012, which complements City of Edinburgh’s longstanding personal safety programmes “Keeping Myself Safe” and “Keeping Myself eSafe” in P6 and P7. Parents/Carers received an email about the ChildLine workshops before the Easter holiday. They will be holding a stage assembly presentation and then a class-based workshop about keeping safe for each class in P6 and P7 on 24th and 26th May. * An awareness of how to get help and sources of help, including ChildLine. The ChildLine Schools Service has discussed with us the content of the assembly and workshop. We are confident that they are appropriate for primary school aged children. All presentations will be delivered in a child-friendly and sensitive style. After taking part in the programme, children will be asked to give their feedback online with school staff present. The ChildLine Schools Service would also very much welcome your feedback. If you would like to share your thoughts, please go to www.nspcc.org.uk/parentsfeedback when your child has completed the programme. Day for Change is getting closer. On Friday 13th May we are asking for donations of loose change to raise money to help Unicef protect children affected by the conflict in Syria. Unicef Ambassador Michael Sheen, who recently visited a refugee camp in Lebanon, has a special message for you. This year, the UK Government will double our Unicef Day for Change donation. Pupils can wear blue on Friday, if you wish. documents our progress towards ensuring that everyone in our school community becomes aware of the Convention of the Rights of the Child and that we use it to underpin our values in embedding Rights Based Learning. We will receive an inspection visit from Uncief’s Rights Respecting Schools on Wednesday 11th May 2016, aiming to achieve a Level One Award. On Friday 13th May at the P4-7 Assembly we reflected on our Rights Respecting Schools Level One Inspection on Wednesday 11th May. We celebrated achieving a Level One Award and all the positive feedback we received. We also thought about some of Unicef‘s recommendations for our next steps towards the Level Two Award. We thanked everyone for generously donating their loose change to Unicef on the ‘Day for Change’ and thought about what we could change to help us make sure everyone knows about children’s rights – at Sciennes and in other countries. P7 Captains took on the task of collecting and counting the loose change. There was so much that they will have to resume counting next week! Thank you very much to everyone who donated. P7 Captains told us about the crisis in Syria and how children’s rights are being affected. The money raised today will help Unicef support Syrian refugee children. Mr Howie showed a video ‘If the world were 100 people’ to continue to help us think about equal rights. P7 Captains congratulated pupils on recent achievements. Next week’s assembly will be at 9.50am and will focus on CEC 1+2 Languages for World Diversity Day. Grateful thanks to the excellent NSPCC ChildLine team, including a retired Midlothian Headteacher, for clear, relevant and perfectly pitched presentations in P7 on Tuesday 24th May 2016. Thank you very much to everyone who donated to Unicef’s Day for Change on Friday 13th May. It took our P7s a long time to count all the loose change! An amazing total of £377 raised! The UK Government will match monies raised for Unicef’s Day for Change, so that makes a grand total of £754! Grateful thanks to the excellent NSPCC ChildLine team for another biennial round of clear, relevant and perfectly pitched presentations – this time to P6 – on Thursday 26th May 2016. We are very excited and looking forward to welcoming Free the Children to Sciennes on Wednesday 15th June 2016 to embrace the pupil leadership opportunities their programme provides for taking action. The ‘Free the Children’ programme will fit extremely well with our well established Junior Awards Scheme Scotland (JASS) programme in P6 and P7 where pupils are asked to take their own action to achieve a ‘Me and My World’ element. JASS is a children’s version of The Duke of Edinburgh Award, and the idea for it actually came from Sciennes! It is now adopted throughout Edinburgh and beyond so has been retitled Junior Award Scheme for Schools. Free the Children will also fit in well with our Unicef Rights Respecting Schools programme. We have recently achieved Level One and our next steps are to continue to extend knowledge of UNCRC and to expand global citizenship. The Free the Children programme will assist us with that. We have highlighted the relevance of the Global Goals for Sustainable Development since their launch in September and the programme also supports that well. Article 29 The right to education which develops your personality, respect for others’ rights and the environment. Article 30 The right to enjoy your own culture, practise your own religion and use your own language. At Sciennes, we recognise that we are incredibly fortunate to enjoy strong partnerships with families and to have such marvellous ongoing parental support. For this year’s Summer Fair, our fantastic Parent Council was able to capitalise on the broad range of cultures within our school community and provide exciting, engaging opportunities to promote learning and respect for one other through an International themed event. We are also most fortunate to have been able to draw upon a huge wealth of parental talent, experience and expertise. Saturday 4th June 2016 saw the culmination of concerted efforts to create a remarkable and joyful parent led International Fair : organised and led by parents – supported by staff and pupils – with many workshops and presentations delivered by parents and also supported by the multitude of parents who attended. We have signed up to get involved in iTeach’s innovative Digital Leaders programme for next session and were delighted to receive a – very fetching – t-shirt, lanyard and badge to help us promote the scheme to pupils early next session. The scheme will open up new opportunities for pupil leadership, as well as advancing pupils’ skills and confidence in using technology. We have already received excellent practical support and guidance from the iTeach team, who have worked alongside staff in school on several occasions, modelling innovative use of iPads with pupils, and have also provided tailored twilight training sessions for us last year. We look forward to engaging with them again on this exciting project. We were delighted to welcome Jacob Gruber from Free the Children to Sciennes on Wednesday 15th June to embrace the pupil leadership opportunities their programme provides for taking action. Monday 20th June is World Refugee Day. Will you sign the petition to stand #withrefugees? Article 22 The right to have help if you are a refugee.